I felt the need to head to the hills for the day and my original plan was to visit High Force and to walk round the south side of the falls. However, having given a fair impression of Quasimodo at YPS the evening before this wasn’t a good idea. 2 miles with full camera kit was going to be a struggle so I decided to got to Keld instead and have a waterfall fest. Posted on March 2, 2019 by Alison Taylor and tagged Keld yorkshire dales swaleldale dales waterfalls wain wath catrigg falls. After a long stretch of boring winter weather the day dawned with some interesting mist and hoar frost on the trees. I spent a while working out which location would provide me with trees that would separate out from the landscape but also provide diminishing layers. Skipwith Common got my vote. Posted on February 1, 2019 by Alison Taylor and tagged skipwith common skipwith york frosty trees frost. If it is January then I must be in Whitby. It is always my first holiday of the year and one that I enjoy very much. It is always quiet down on the front and on the piers and I am only a five minute drive from the delights of Saltwick Bay. This year I made two trips to the bay. I, along with a few other togs, visited pre-dawn on Sunday morning and then I returned a couple of days later to explore the area around Saltwick Nab. The light on Sunday morning wasn’t particularity promising but fortunately the sunlight shone through the bank of cloud for a few minutes before rising up out of sight. Posted on January 26, 2019 by Alison Taylor and tagged saltwick bay whitby yorkshire coast sunrise saltwick shields black nab saltwick nab. I recently met up with Ruth Grindrod for a day’s photography in the Yorkshire Dales. We have chatted on Facebook for a while so it was really nice to actually meet up and for me to show Ruth a few new locations. Posted on December 7, 2018 by Alison Taylor and tagged cray upper wharfedale wharfedale yorkshire dales yockenthwaite langstrothdale. The weather on Arran was extremely variable which meant that apart from rain dodging we were able to enjoy some stunning light offshore. Here are some of my favourite photographs from the week on Arran. Posted on October 20, 2018 by Alison Taylor and tagged arran sunbeams rainbow sunshine storm clouds. A friend at York Photographic Society kindly wrote on my 2nd hand OS map some of the locations and walks not to be missed on my recent visit to the Isle of Arran. As I was travelling with a good friend who wouldn’t want to stand behind me in the cold whilst I took photographs I usually set off early morning with my camera and returned to the house in time for breakfast. Posted on October 8, 2018 by Alison Taylor and tagged Pirates Cove sunrise sandstone erratics arran. At the end of August I set off on my annual holiday to Grasmere where I was due to help at Grasmere Sports and then to enjoy a few days with my camera. Posted on September 21, 2018 by Alison Taylor and tagged grasmere lake district blea tarn brathay hodge close high dam rydal rydal water. A few weeks ago I was asked if I would like to write an article for On Landscape Magazine, a digital magazine for landscape photographers. I was asked to choose one of my favourite photographs and write about why I like it and how it has influenced my own photography. After some thought I decided to select a coastal photograph that would start a discussion about my love of coastal photography. I found Jenifer Bunnett's photography via Instagram and I loved the variety and scope of her work. 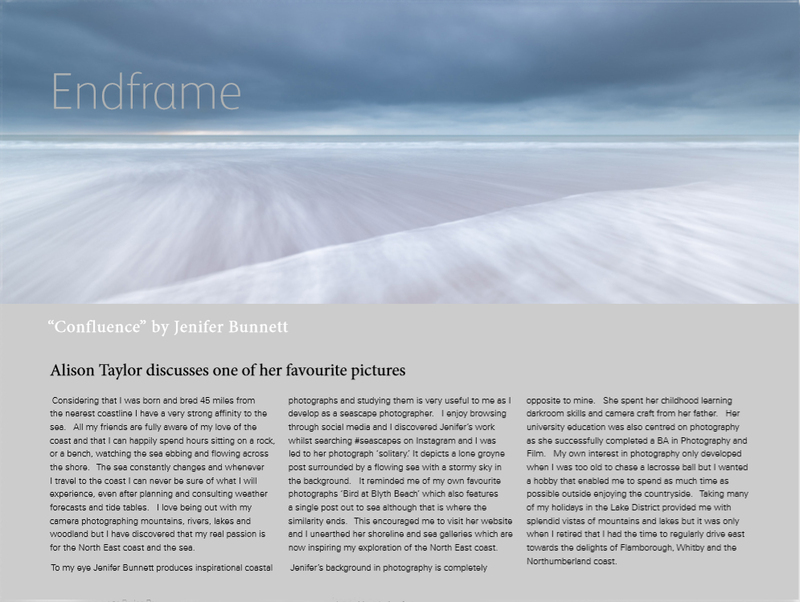 The brief was to write about her photo, why I like it and how it relates to my own photography. The article was published a couple of weeks ago and seems to have been well received. I certainly enjoyed writing it. Posted on September 6, 2018 by Alison Taylor. Last weekend I went on a David Speight workshop in the Yorkshire Dales and on Sunday morning we walked up Twistleton Scar and onto Scales Moor to find the eggy erratic. This wasn't as straightforward as you may think as we caught the tail end of Tropical Storm Ernesto which meant the weather was distinctly unpleasant. Posted on August 23, 2018 by Alison Taylor and tagged scales moor twistleton erratic one legged robin yorkshire dales weathered trees. On my recent trip to the Rockies I expected to see quite a few glaciers in the area around Lake Louise and along the Icefields Parkway between Banff and Jasper. However, nothing prepared me for the scale and magnificence of the icefield of Glacier Bay, Alaska. Posted on July 18, 2018 by Alison Taylor and tagged glacier bay glacier alaska icefield marjorie glacier lamplugh glacier. A few people have asked me about the process of applying for the LRPS Distinction and my motivation for doing so. Whilst I had some experience of editing photographs in digital software I was a complete novice when it came to printing and preparing prints for exhibition. I joined York Photographic Society to learn from other members through discussion and feedback via project nights, competitions and exhibitions. Posted on June 14, 2018 by Alison Taylor and tagged LRPS royal photographic society distinction award RPS Licentate royal photographic society. I woke up at 4.30am and looked out of the window towards Walla Crag and noticed that there was some mist which was obviously hovering over Derwent Water and the sky was just beginning to get light. There wasn't a moment to lose so I flung on the previous day's clothing, grabbed a pair of socks along with my camera bag and rushed out of the cottage. At the same time I was trying to think where to go. Posted on June 2, 2018 by Alison Taylor and tagged Derwent Water keswick lake district mist dawn. Last week I went on a small group workshop with Lizzie Shepherd to explore Nidderdale (near Blubberhouses) and to photograph details, trees and the Washburn Valley. I really enjoyed my day in the valley focusing on images that are out of my comfort zone and that didn't involve sand, the sea and waves. Posted on May 14, 2018 by Alison Taylor and tagged washburen nidderdale NAOB north yorkshire blubberhouses lizzie shepherd. As the current President of York Photographic Society I have one evening scheduled for me to give a presentation. Whilst I have given short talks about my photography I've never spoken for an hour and a half about my 'work'. Posted on April 26, 2018 by Alison Taylor and tagged yps york york photographic society yps alsion taylor president president yps yorkshire coastal photography coast. I have been enjoying different aspects of coastal photography and I've been inspired by Rachel Talibarts 'sirens' photographs of waves. In addition to photographing sand, big skies and piers etc I thought I would like to try photographing breaking waves. There is so much power in the water and I love the point at which the wave develops a sharp edge just before it breaks up into spray. Posted on April 24, 2018 by Alison Taylor and tagged barmston waves spray breaking waves yorkshire yorkshire coast.